David Shriver, Jr. was in 1797 co-founder of the "Union Mills Homestead" with his older brother, Andrew. Their parents were David Shriver, Sr. and Rebecca Ferree, daughter of Abraham Ferree. In 1803 David Jr. relinquished his interest in the mill to accept a supervising position in the construction of the Baltimore-Reistertown Turnpike. He married Eve Sherman that same year. Eve's father, Jacob Sherman, owned a tavern in Westminster, Carroll County, Maryland. In May of 1806 he purchased a lot opposite his tavern and began building a house. It is questionable as to whether this might have been a belated wedding present to his daughter or possibly a new residence for him when he retired. David Shriver had experience as a civil engineer and some of the features in the house suggest he had a prominent role in the design of the house. The counter-balanced windows and a built in clothes cupboard in the Shriver bedroom were unusual for this region in 1807. The Shrivers were already living in the house when Jacob Sherman sold the property to his son-in-law for a token fee of five shillings. It is believed the Shermans lived with the Shrivers. Having completed his work on the construction of the Turnpike, he became a candidate for a similar position for a proposed extension of the National Road from Cumberland, Maryland to Wheeling, now West Virginia. This required him to move his family to Cumberland. 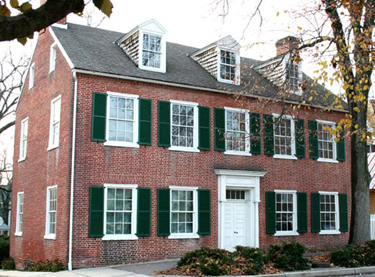 On August 4, 1812, David Shriver sold the house to his father-in-law, Jacob Sherman, for $3,250. The Shriver's departure caused a rift with the Shermans which never healed. A restoration of the house begun in 1983 was completed in 1990. Located on East Main Street in Westminster, it is known today as the Sherman-Fisher-Shellman House and is maintained by the Historical Society of Carroll County. Additional information and photos available at: hscc.carr.org/research/yesteryears. David Shriver, Jr. was born in 1769 and died in 1852. He married Eve Sherman. Lineage: David Shriver, Jr. & Eve Sherman/ David Shriver, Sr. & Rebecca Ferree/ Abraham Ferree & Elizabeth Eltinge/Philip Ferree & Leah Dubois/Daniel Ferree & Marie Warenbur. Source: "Carroll County Times Article for 12 January 1997" by Jay A. Graybeal; "Historical Society of Carroll County Website" , hssc.car.org.